The music business has grown used to describing the ‘typical’ price for a music streaming service as $9.99 a month – but the truth is a little less impressive. When factors such as promotional pricing, variable territorial costs and mobile bundles are taken into account, the figure comes out rather smaller… and it appears to be shrinking. 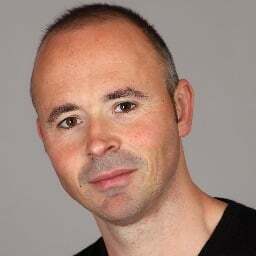 According to a new Streaming Music Pricing report from Mark Mulligan’s MiDIA Research, the average global per-user monthly streaming subscription payment across services such as Spotify and Apple Music stood at $6.49 in 2015. That represented a 24% drop on the $8.24 monthly average seen in 2013. MiDIA’s report – which reviews the current price inelasticity of the music business’s streaming offerings – also brings more complimentary news for existing streaming services. According to MiDIA’s latest figures, there were 106.3m music streaming subscribers around the globe at the end of 2016. That jump was bigger than the equivalent growth in 2014 and 2013 – proving that paid music streaming’s expansion is accelerating. The big question Mulligan poses: how long can this growth last without more experimental pricing? 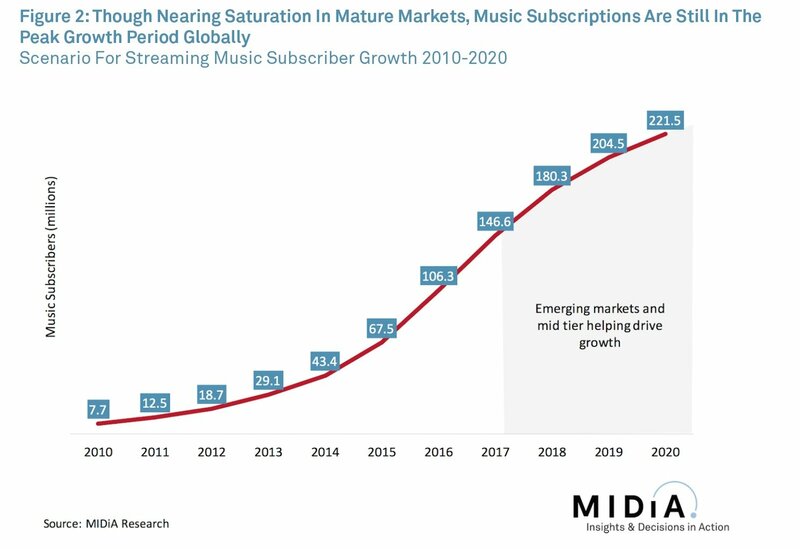 MiDIA’s prediction is that by 2018 subscription growth will start slowing, as the potential of evolved streaming markets (US, UK, Sweden, Brazil, France etc.) begins hitting saturation point. If streaming music evolves to offer a more sophisticated tiered pricing menu, suggests Mulligan, there will be 221.5m total active subs worldwide by the end of 2020. “This growth, however, will be dependent upon strong growth in emerging markets and larger, more mainstream audiences being unlocked in emerged markets, with pricing playing a key role,” he observes. The MiDIA report notes that 19% of current streaming subscribers have expressed interest in some kind of ‘Premium plus’ tier for $19.99 a month – offering extras which may include artist-specific bonuses or HD streaming content. Interestingly, MiDIA’s research suggests that a switch to $6.99-a-month pricing as a standard tier today (instead of $9.99-a-month) would ultimately reduce the revenue being generated by music streaming, despite a small increase in the overall audience.